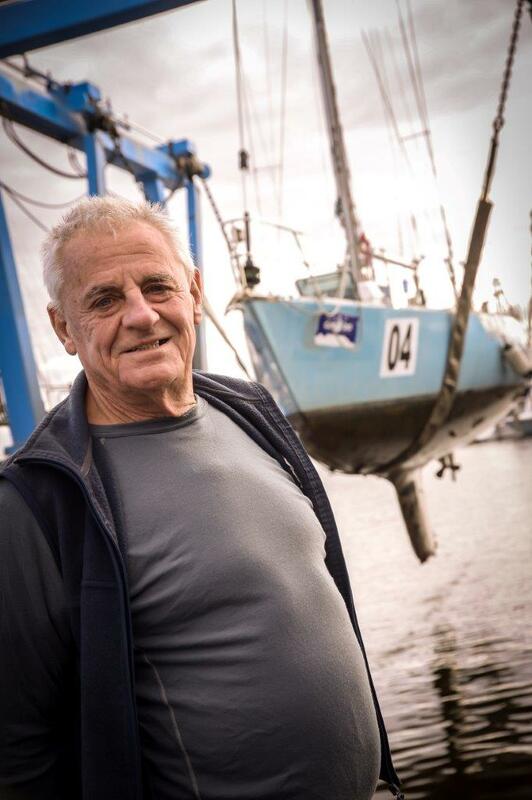 Front Page Archives - Jon Sanders 10th Circumnavigation! Jon Sanders Record Breaking 10th Circumnavigation of the Globe from Different Suns on Vimeo. 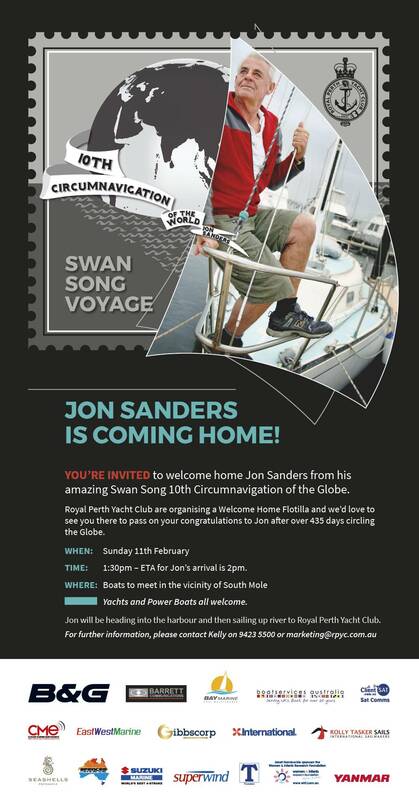 Jon Sanders is coming home! It is near 2000 nautical miles to transit the Great Australian Bight, to Perth/Fremantle on the West Coast. 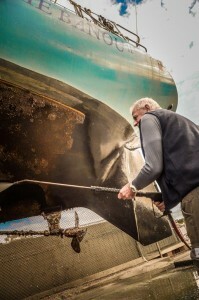 I depart the Tamar River – North Coast of Tasmania. It is near 2000 nautical miles to transit the Great Australian Bight, from the East Coast of Australia to Perth/Fremantle on the West Coast. In years past one would depart on a due date and time. Say, 11am, as long as a gale was not blowing. Get up when I feel like it; buy the newspaper and breakfast in the cafe and then casually depart. Queensland’s Southport Yacht Club is located inside the Seaway, waterways of the Gold Coast. The Seaway runs parallel to the ocean beach, its construction helped to make the Gold Coast what it is today. Big towers and lots of people in them, expensive, I suspect, looking down at the yacht club and its Marina. The ladies in the Marina office were nice and very helpful (so too the ladies at Coffs Harbour). Taking one’s lines on the finger when parking on the finger. I should sometimes write parking and re-parking. What do I mean re-park? Because the idiot just birthed in somebody else’s pen or T-end of the jetty. I’ve got to move (i’d arrived after hours – night time). I did not know where to go. Lost in a Marina! When I came in I had the two bow lines either side of the bow at the ready, as well as two spring lines for the middle – either side, likewise two stern lines. When possible, I pick the windward side of the finger, dock or wharf, come alongside near-to; stop the yacht and let it blow sideways onto the dock (fenders are out). 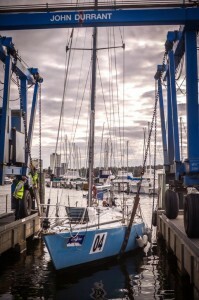 Fenders, wind and friction hold the yacht in place sufficient to step off and connect the mooring lines. Lush green and plenty of rain. Hmmm, I must be talking about in other years. It’s dry! Bundaberg Queensland: East coast of Australia. Bundaberg region population near 100,000. Lush green and plenty of rain in the region. Hmmm, I must be talking about it in other years. It’s dry! In Perth, on Australia’s west coast (the other side of the continent, i.e. the other side of the desert), it has a Mediterranean climate: rains in winter and dry in summer; homeowners and tenants in the suburbs hand water their lawns. Not in Bundaberg. They are not used to that. The lawns are brown and dry. They won’t be that way for long, as the northern storm season is near. In the meantime, the fronts and low-pressure weather systems come from the west to the southern portion of the south-west region of Australia. They sweep across the Great Australian Bight bringing rain, wind, gales and storms. In the Bass Strait region, this weather can squeeze with other lows and depressions (The Bass Strait being between the Island state of Tasmania and the south-east of Australia), causing fronts with gales to sweep northwards along the Australian south-east coast. The Equinox period (September) bring gales, sometimes severe. One must pick; ‘be picky’ and sail between the weather patterns. It would be stupid not to be picky (when possible, that is). My progress over the last several hundred miles may have seemed slow. I have arrived Bundaberg Queensland. My progress over the last several hundred miles may have seemed slow. My ETA was Monday morning, from New Caledonia, but I got here on Monday. One can always slow down. That’s a bit easy. Speed up. Hmmm.. “get real”. Me anyway. The passage from New Cal. was perfect. Quiet and mild, with some zero wind for several hours – some of the time. Calm. That is when I connect the tiller and put the electric auto steer tiller pilot to on. It wasn’t working leaving New Cal., but I got it going with WD40. I think moisture had found its way in. It stuck things and helped not the electric circulation. The wind vane self-steerer, which connects to the wheel – not the tiller – needs a bit of wind pressure, but it’s reliable. 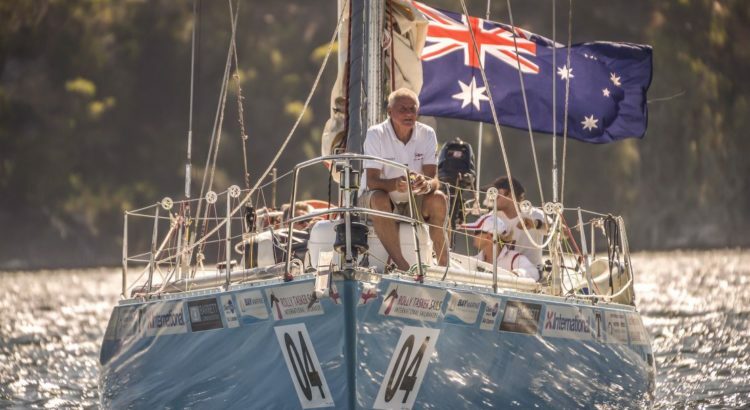 A solo-sailor, who’s just completed his 10th circumnavigation of the world, has arrived in Bundaberg. Jon Sanders says he keeps repeating the trip because it gives him something to do.